Anthropologist Napoleon Chagnon is famous for portraying the Yanomami Indians as "fierce people"--i.e., violent savages. Recently he came out with his autobiography, so the subject is in the news again. I've posted on Chagnon and the Yanomami before, and I didn't want to rehash the old controversies. Fortunately, someone sent me a posting that's done the work for me. The myth of the ‘Brutal Savage’Portrayals of Indians as violent savages remain common. Perhaps the worst recent example of this characterization comes from the controversial US anthropologist Napoleon Chagnon, who carried out fieldwork with the Venezuelan Yanomami from the 1960s. In his book, Yanomamö: The Fierce People, Chagnon constructed a sensationalist image of the tribe, describing them as ‘sly, aggressive, and intimidating’, ‘fierce’, ‘continuously making war on each other’, and living in a ‘state of chronic warfare’. The Fierce People was a best-seller in the USA and is still a standard text for anthropology students today. It is also a key source in many recent popular science books by writers such as Jared Diamond and Steven Pinker, which also promote the myth of the ‘Brutal Savage’. Despite the popularity of The Fierce People, Chagnon’s findings have been severely criticized by others who have extensive experience of the Yanomami. Many anthropologists, doctors and missionaries that have worked over many decades with the Yanomami simply do not recognize Chagnon’s characterizations, and profoundly disagree with his depiction of the tribe. On 19 February 2013, Chagnon released his autobiography, Noble Savages: My Life Among Two Dangerous Tribes--The Yanomamö and the Anthropologists. 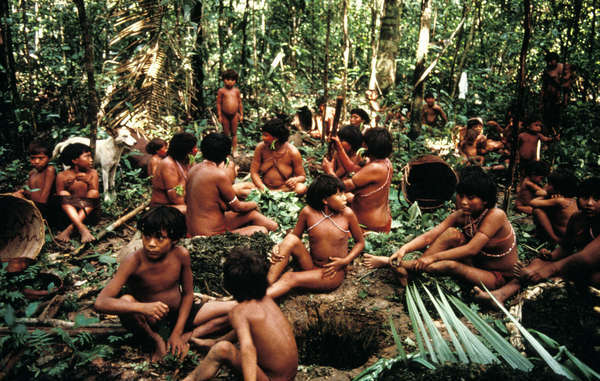 Many anthropologist specialists in the Yanomami of Venezuela and Brazil have signed an open letter condemning Chagnon’s characterization of the Yanomami. Eminent anthropologist Marshall Sahlins explains how Chagnon exploited his Yanomami subjects to achieve his aims. Sahlins recently resigned from the US National Academy of Sciences in protest at Napoleon Chagnon’s election to the Academy. Leading Brazilian professor of anthropology Eduardo Viveiros de Castro says the Yanomami are anything but the nasty, callous, sociobiological robots Chagnon makes them look like. Prominent anthropologists Philippe Descola and Manuela Carneiro da Cunha have issued statements about Chagnon’s work and Sahlins’s resignation. Experts wrote to the Daily Telegraph, to protest at an article repeating Chagnon’s views in 2001. Carlo Zacquini, a Catholic lay missionary who has worked and lived among Yanomami for nearly 50 years, ‘never found them to be violent’.Comment: The article has links to more articles for further information. For more on the Yanomami, see Cannibal Indians in Green Inferno and Why The World Until Yesterday Is Wrong. I kinda have a love-hate relationship with Darkness at El Dorado. I understand what they were going for, but it would be more powerful if Tierney hadn't tried to link it to his antivaccine views. The difficulty with sociobiology, oh, sorry, "evolutionary psychology" (to be PC) is that it has no mechanism behind it. It's mostly entirely just the tautological and teleological notion that 1) X is human nature, therefore 2) X must have some evolutionary purpose, and 3) once we can somehow glean that purpose, it proves that X is human nature. Never mind that 2 is...evolution does not work that way. Of course, this discussion on Chagnon's methods is rendered moot by the fact that "uncontacted" Indians are anything but. They're basically survivors who avoided the slavery, epidemics, and mass murder associated with the rubber boom of the 20th century. So they're not nearly as representative of Pleistocene ancestors as Chagnon would believe.